US crude supplies registered another big drop this week. The Energy Information Administration reported that supplies fell by 4.2M barrels to 24 June a much bigger drop than the 184,000 barrels that oil analysts had forecast. Brent crude rallied $1.5 to $53.9 reversing a week long bear rally. Suppressing gains however was the fact that supplies of distillates which are used in the production of diesels and heating oil rose on the week. The Canadian dollar managed to extend its rally against the greenback. The “loonie” surged yesterday after a report showing that product and material prices had risen above expectations – something that will add strength to the commodity dependent economy. USD/CAD slid to 1.2894 breaking a two week low. The strength of the US dollar had sent the pair above the 1.30 line for the first since 2009. CAD/JPY also posted another green day rallying to 95.96. The pair has rallied 1.7% in the past two days. 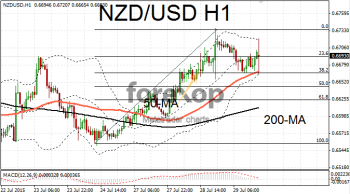 The Australian and New Zealand dollars were stable and showed little signs of sagging after the breaking news from the FOMC. AUD/USD nudged lower to 0.7312. 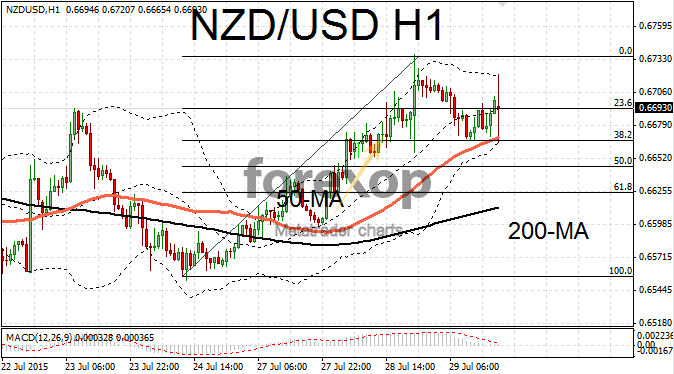 NZD/USD suffered its first down day in three falling back to 0.6687. Support was found at the Fibonacci 38.2% retracement line.